Home » Do Horses Like Humans? All Things Horses are Here! Do Horses Like Humans? All Things Horses are Here! Nowadays, horses are seen along with people everywhere in various life aspects such as our work, horse races, etc. Since they have long been around us, it's no doubt that people are concerned a lot about this animal. The bond between human and horses has strongly be built through time. That’s why tons of questions were asked. Does any similarity between the two kinds of creatures tighten the relationship? So, do horse like humans? Here, we get all the truths revealed with insightful information about beloved horses. Let’s start, now! Do horses like humans in different fields? Do horses like being ridden on? How do horses talk to humans? Can horses consume human foods? What about horses age and health status? Do horses sleep at night? How similar are horses and humans? And, do horses like humans? Besides the body-related similarities, you may be wondering about the way horses will act in the same manner as us. A recent study conducted by some researchers in Switzerland showed that a horse’s voice would reflect its emotions, unusually. Like humans, horses produce several kinds of sounds whenever they’re excited, of course. For a horse team, long whinnies are produced when the horse bunch was separated, and the short ones were created for the reunion. Each whinny comes with two distinct frequencies conveying different emotional information. Even, horses like being ridden when in training progress, but wild horses may not like it. The trainer will gain the trust of horses and get used to him/her. Indeed, horses also get considerable intelligence and easier training. One more question is that “Do horses know that they’re racing?” Yeah. Horses accept the training based on the trust for humans. Therefore, they attend the races at their finest ability. And make sure that you always wear a best horse riding helmet on your head when riding them! Tails are the useful communication tool of this friendly animal. They are utilized in many ways. For instance, a horse experiencing discomfort or pain will tuck their tails in tightly. However, for horses with colic, they may carry their tails at a higher angle from its body. When being annoyed, a horse will swish its tails from side to side strongly. And, a particularly irritated equine may swish its tails up and down. When the tails are unusually high, it is the sign describing the equines in high spirits. Commonly, they indicate their relaxing state. Yes, and no? 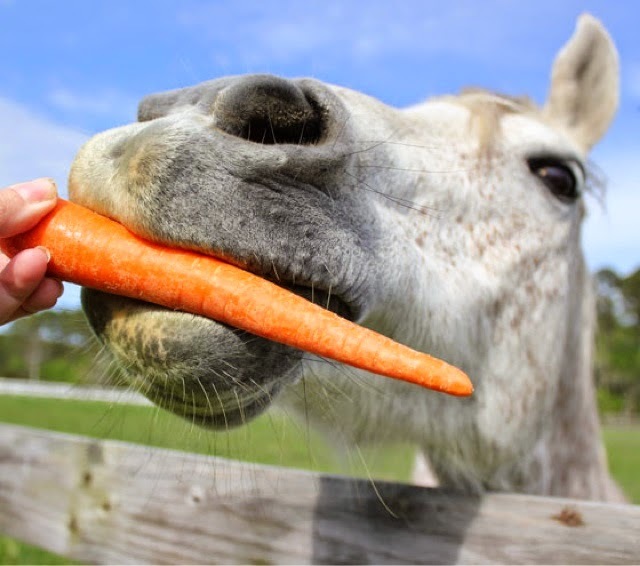 To be honest, horses can eat some human foods such as almost any fruit or vegetable. Their favorite human foods are carrots, bread, eggs, apples, oats, and oatmeal. Nonetheless, they can’t consume meat, chocolate, coffee, candy, etc. Equine ages approximately about three times faster than humans. So, if a horse is around 3, then he/she would be nine concerning human years. And, can horses get sick? Yes, of course! If they have to work without resting, good treat and care, suitable food, they will quickly get exhausted and gradually die. Therefore, the horse owners should always look after their animals. Does a horse use their brain and strength as a human? Horses don’t control everything logically like humans. They don’t do the math, but they are still intelligent. They are friendly and easy to control. Never look off on them, though! Everything has their limit, so do horses. Don’t force them under pressure too much if you don’t want to be at risk. How strong is a horse? Indeed, a Clydesdale could easily crush any person. In other words, even a healthy and strong man intending to combat a horse with his bare hands without tools would lose. So, are horses dangerous? We are sure that you find yourself the answer now, for real. Have you ever wondered if horses slept at day or night? Sleeping while standing up is actually what tons of animals like horses do. Fear of predators, equines spend most of their sleeping time during the day. And, horses don’t sleep like us. Most humans need at least 8 hours of sleep every night, right? In contrast, horses don’t do like that. Frankly speaking, they are kind of awake and moves virtually almost all the time. A mature horse takes two hours daily with short periods.15 to 20 minute of naps throughout day and night is enough for them. Even, they only need a couple of hours in every four-five days as their minimum REM sleep required. As a fact, these friendly animals don’t mind working hard. However, never push them to their physical limits often. And, the fact is that equines also get sore, grouchy, and tired just like how people do. Some proper horse care will support the horse owners or trainers realizing whenever the horses need a certain break. Genuinely, whatever task your horse is performing such as a leisure ride or a sports competition, give it a break. That’s enough! The truth is, horses which have trusted and formed a tight and strong bond with the owners and riders will do their best in their performance. Nevertheless, it's essential to realize when horses are exhausted as easily as how humans do. As a long-term companion, equines have been by humanity’s side for centuries. Originally, these four-legged animals are incredibly vital for our life-related aspects. But then again, don’t overuse the equine power. Just get them utilized enough. Usually, let them have the rest and break time. Also, reward them for their respectful effort in work and training. As a result, they will always trust you, and you can go further with good horse’s behavior. Up to now, horses have long remained the most popular animals for both sport and leisure. Even though all things equine-related are quite familiar to us, some myths about this great animal persist for several years, yet. So, do horses like humans? Well, that’s the reason why I collected this information above. Read it until the bottom of the article, right? You are fully acknowledged, now!